Discover great walking trails on this self-guided walking holiday to Gran Canaria. This journey takes you from the east to the west of the island through dramatic and varied volcanic landscapes, often on the classic paths, the 'Caminos Reales'. Upon your arrival at Gran Canaria Airport, you will be transferred to Aguimes on the south-eastern part of the island, where you'll spend the next two nights. The rest of the day is free to relax, perhaps taking a short wander through the medieval streets of the small old town before dinner. After breakfast, today starts with a transfer to the start of the trail. You'll spend today amongst the towering cliffs of the Guayadeque gorge, the largest ravine in the Canary Islands. Home to many endemic species, some say this hidden gem is one of the most beautiful places on the island. The gorge was also home to the first inhabitants of the Canary Islands and you can still see the remains of their cave houses along the way. Today's walk is 11.5 kilometres long and should take around 4.5-5 hours. Total ascent is 400 metres and descent 820 metres. Depending on how energetic you're feeling and how much distance you'd like to cover, you have a choice of three start points for today's route, all with the aim of reaching the top of Gran Canaria's highest peak, Pico de las Nieves. At 1,949 metres high the views from the summit are incredible. It can often be cold and misty at the top but if the weather is good, you will be able to see over the surrounding mountains and maybe even as far as the neighbouring Canary Islands: Lanzarote, Tenerife and La Gomera. As you begin to descend, your final destination is the village of Tejeda, where you will spend the next three nights, set amongst the mountains of central Gran Canaria. Today's walk is 19 or 11 kilometres long with 450, or 50 metres of ascent and 900 metres of descent; the longest route should take around 7 hours, the shortest should take around 4 hours. Today's walk over the Altavista ridge is one of the highlights of the entire week. Walking at the edge of Tamadaba Natural Park on a huge extinct crater (caldera), with little shade, there may be clouds below you and - on a clear day - sweeping views all the way to Tenerife. The same bus which takes you to the start of the walk in the morning will pick you up this afternoon in Artenara. Today's walk is either 14 kilometres taking approximately 4.5 hours with ascent and 500 metres ascent and 450m descent, or 9 kilometres taking approximately 3 hours with 300 metres of ascent and 300 metres of descent. After the walk, you'll have time to visit the Spice Centre in Tejeda for an insight into the traditional use of medicinal plants on the island. There's a botanical garden and laboratory, and you'll have the option of sampling different spices. Tejeda also has a small museum and cultural centre with ongoing exhibits. This evening, enjoy the sunset from the hotel (roof-top) terrace, with the silhouette of Bentayga Peak in the background. Starting directly from the hotel, today's route traverses the gorgeously steep terrain around Roque Nublo, a rocky outcrop teetering on the edge of a plateau. This may not be the highest peak on the island but it is certainly the most easily identifiable, as it's visible from almost anywhere on the island. After a kilometre the tarmac gives way to steep paths which zigzag up towards Roque Nublo. The peak's volcanic origins become evident higher up and you gaze hundreds of meters down steeply eroded ravines. Descend through a peaceful pine forest to reach a col from where you can catch a bus back to Tejeda or continue on foot to the village. Todays walk is 12 kilometres long, with 800 metres of ascent and 400 metres of descent, and should take around 5.5 hours. If you feel like walking further, you have the option of continuing down along the old Camino Real back to the village. This adds 2 hours and 8km to your walk, with 400 metres extra in descent, 75 metres extra in ascent. Leaving Tejeda behind today the next and final destination is Agaete on the north west coast of Gran Canaria. 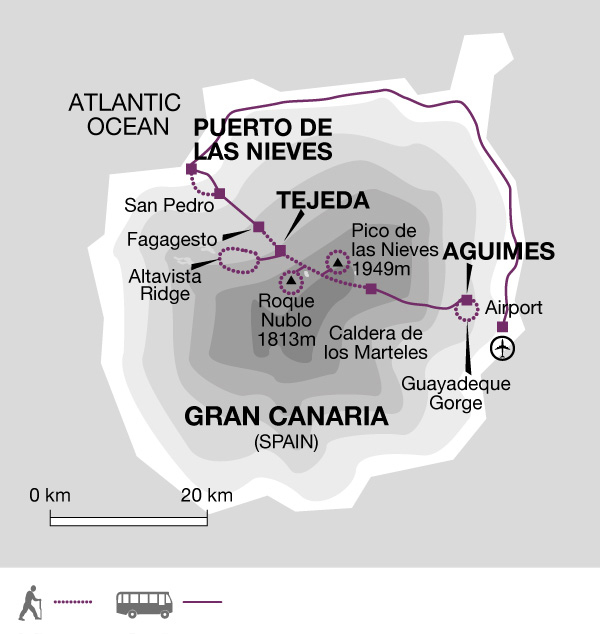 The first four kilometres of the route has 450 metres of ascent to reach La Cruz de Tejeda. From here following the ridge with impressive views of the sea you reach an elevation of 1715m, near Galdar. Then, you will begin a long descent through fields and small farmsteads. The final part of this route is along traffic free tarmac roads until you arrive in Fagagesto. Here you can stop for refreshments before transferring to Agaete where you'll spend your final two nights. 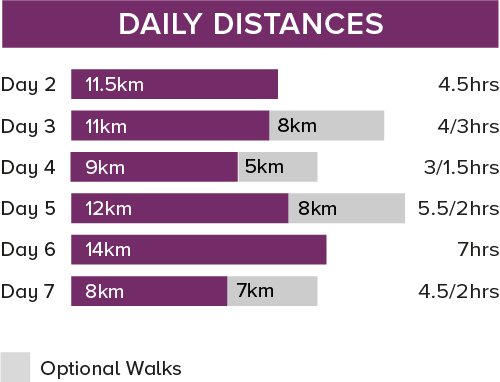 The walk today is 14 kilometres and takes approximately 7 hours. Total ascent is 700 metres and descent 750 metres. A taxi will take will take you to the village of San Pedro for the start of today's walk along the Camino Real. Ascending to the top of Montana Bibique (645m), a rugged outcrop at the top of steep cliffs, you'll have fabulous views over the Agaete Valley. From here you may wish to walk further on to Mirador Vuelta de la Paloma at 850 metres, which adds an extra 5 kilometres to the route. Alternatively you can continue along a narrow gravel path back down to Puerto de las Nieves and your hotel. Today's final walk is 9 kilometres and takes approximately 4.5 hours. The total ascent is 630 metres and descent is 650 metres. The additional walk via the view point is an extra 7 kilometres which adds an additional ascent and descent of 60 metres and takes approximately another 2 hours. Today a taxi will pick you up and take you to Gran Canaria Airport, where the trip ends. Bring some lightweight clothing for pleasant, balmy days (including shorts for walks when warmer), but remember that temperatures drop with altitude and that evenings may be cool so also bring a warm sweater or fleece. As mountain weather is changeable it is important to bring a light waterproof and windproof outer garment. Bring one main piece of baggage as per your airline luggage allowance, maximum 20 kg per person. Remember you may need to carry your luggage at times so don't overload yourself. Luggage transfers between hotels are normally arranged by the hoteliers. Mark your bags clearly and leave them at the place and time arranged with them. When travelling on public transport you should always keep your luggage with you. - Canary Islands - ADAC scale 1:150.000 Overview in fairly good detail (though less on the smaller islands). Still the best choice for a general map. -Gran Canaria, map 237 (scale 1:50.000) Published by Kompass editions. Gran Canaria is served by low cost carriers (EasyJet, Ryan Air, Norwegian) and charter / schedule airlines (including Flythomascook.com, Thomson Airways) direct from many UK airports. Your trip starts at Gran Canaria Airport. A taxi transfer will take you from here to your hotel in Aguimes. At the end of your trip you will be taken back to the airport by taxi. Please ensure that Explore have your full arrival and departure details (airline, flight number, date and time) at least two weeks prior to departure. Walks on 6 days for between 3 to 7 hours, mainly on well maintained unsurfaced and footpaths. On Day 3 and 5 there are optional additional walks. The average ascent and descent is +/- 500m (minimum 250m, maximum 900m). Please note warm weather can make the routes seem more difficult. Tue 1 Jan 2019 - Mon 6 May 2019 Your trip can depart anytime between the above dates. Contact us for triple room requests and solo traveller prices. Information A taxi transfer is arranged for the end of you trip with Taxi Oscar from Agaete. Please see your Destination Manual and Route Book for details. Tue 7 May 2019 - Tue 28 May 2019 Your trip can depart anytime between the above dates. Contact us for triple room requests and solo traveller prices. Wed 29 May 2019 - Thu 27 Jun 2019 Your trip can depart anytime between the above dates. Contact us for triple room requests and solo traveller prices. Fri 28 Jun 2019 - Tue 27 Aug 2019 Your trip can depart anytime between the above dates. Contact us for triple room requests and solo traveller prices. Wed 28 Aug 2019 - Fri 27 Sep 2019 Your trip can depart anytime between the above dates. Contact us for triple room requests and solo traveller prices. Sat 28 Sep 2019 - Tue 29 Oct 2019 Your trip can depart anytime between the above dates. Contact us for triple room requests and solo traveller prices. Wed 30 Oct 2019 - Thu 31 Oct 2019 Your trip can depart anytime between the above dates. Contact us for triple room requests and solo traveller prices. Wed 1 Apr 2020 - Thu 30 Apr 2020 Your trip can depart anytime between the above dates. Contact us for triple room requests and solo traveller prices. Fri 1 May 2020 - Tue 14 Jul 2020 Your trip can depart anytime between the above dates. Contact us for triple room requests and solo traveller prices. Wed 15 Jul 2020 - Mon 31 Aug 2020 Your trip can depart anytime between the above dates. Contact us for triple room requests and solo traveller prices. Thu 1 Oct 2020 - Thu 29 Oct 2020 Your trip can depart anytime between the above dates. Contact us for triple room requests and solo traveller prices. Fri 30 Oct 2020 - Thu 31 Dec 2020 Your trip can depart anytime between the above dates. Contact us for triple room requests and solo traveller prices.